With law firms racing to offer game-changing tech-based solutions and clients becoming increasingly more tech-savvy, the legal market as we know it is rapidly changing. But what does this mean for the next generation of lawyers? Over 90 students headed to BPP University Law School’s (BPP) Holborn campus last week for the second instalment of our Inside Track series. On hand to field their questions were Nitish Upadhyaya, senior innovation manager at Allen & Overy (A&O); Zoe Fuller, legal director at Bird & Bird; Molly Russell, associate and global innovation consultant at Freshfields Bruckhaus Deringer; Jeremy Coleman, innovation manager at Norton Rose Fulbright (NRF); and Adam Curphey, head of development (innovation technology) at BPP. To put things into perspective, Russell, who specialises in commercial disputes, shared an example with the audience. On suitable cases, her team use predictive coding software for e-disclosure. Thousands of documents can be examined and pinpointed for review by nifty tech tools in a matter of hours — an exercise that would have previously taken several hundred paralegals and junior lawyers months to complete, she explained. This sentiment was echoed by Russell. The way rookies learn the law hasn’t changed, but the way they deliver advice has. For example, “they’re dealing with a lot less paper!” she quipped. On top of this Russell pointed to the agile work movement that has filtrated into legal practice and, in turn, brought about significant cultural changes within City law firms. “You might conduct some research on an iPad on a train while on the go or look things up during a client meeting,” she noted. As law firms embrace innovation through technology to keep up with the pace of change, it’s imperative that law schools, who prepare future lawyers for the world of work, do the same. BPP launched a legal technology innovation and design module last September to plug the notable tech-shaped skills-gap on its Legal Practice Course (LPC). The module equips students not only with the digital skills the legal practice of the future will need, but also the ability to use and design technology to respond creatively to clients’ problems. “We lay the foundations and hopefully the students we send into firms can look at any piece of technology, any innovation or any issue and say ‘I know how this works and I can tackle this’,” explained BPP innovation chief Curphey. The legal profession has embraced artificial intelligence (AI). A clutch of City law firms have launched their own in-house tech hubs, while others have invested large sums in externally-developed products. The convergence between law and computer science has seen one particular group of students catch the eye of graduate recruiters. 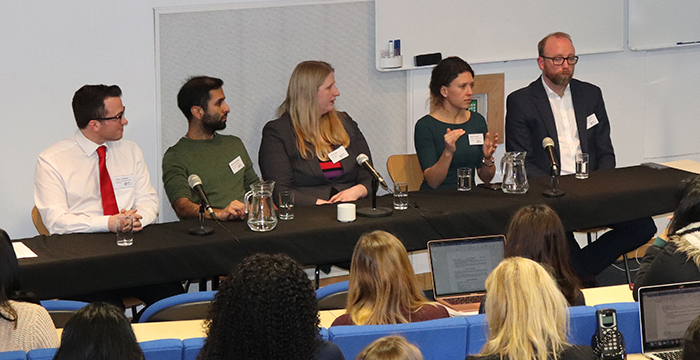 Indeed, STEM (science, technology, engineering and maths) students are highly sought after for their specialist knowledge and transferable skills, the panel noted. Technology has created a wave of new legal roles and last Wednesday’s panel were testament to this fact. Coleman worked in various tech start-ups for eight years before moving across to legal practice. Heading up the firm’s Newcastle hub, Coleman is responsible for delivering innovative client solutions through legal design. What are the priorities he thinks Generation Z should be focusing on? Curphey, who practised as a capital markets solicitor at White & Case prior to joining BPP, pointed out that law firms are focusing their efforts on the “rounded legal team”. The successful lawyer of the future is one that will be able to work closely with project managers, software developers and innovation experts to deliver a solution, he said. It’s not just jobs. Looking ahead, Coleman noted that “new practice areas will emerge that we didn’t know could exist”, and that in itself presents a plethora of opportunities for lawyer hopefuls. In the true spirit of tech, the audience participated in a live online poll. What did they think would change the legal profession the most over the next decade? Technology got the winning vote, but flexible working arrangements and (surprise surprise) new Generation Z priorities followed closely behind.